4 + nine = Required Please enter the correct value. The Dow Jones Industrial Average today (Thursday) kicked off the fourth quarter with a 12-point slide as investors prepared for tomorrow's report on non-farm payrolls. Meanwhile, the S&P 500 and the Nasdaq were both up marginally to finish the session. A busy day of mixed economic data featured a decline in U.S. manufacturing activity and a strong jobless claims figure. Meanwhile, the slowdown in China continued to spook investors. This morning, China reported its Caixin Manufacturing PMI, a gauge of nationwide manufacturing activity, fell to a six-and-a-half year low of 47.2 in September. That compares with a reading of 47.3 in August. The S&P 500 Volatility Index (VIX), the market's fear gauge, dipped 7.1% on the day. 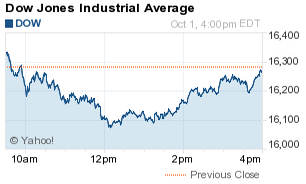 Stock Market News: Five of 10 S&P 500 sectors were in the red this afternoon. The Dow was pushed into the red after a sell-off in utility and technology stocks. Utilities were down nearly 0.7%, with ITC Holdings Corp. (NYSE: ITC) being the biggest decliner as shares fell 4.1%. Oil Prices Slip: Oil prices slipped this afternoon after government officials announced a change to the path forecasts for Hurricane Joaquin. WTI prices dipped 0.2% to hit $44.98, while Brent oil prices declined 0.8% to hit $47.97. Energy stocks were on the rise today, with the broader sector adding 0.7% on the day. Gains were found in midstream energy plays like DCP Midstream Partners LP (NYSE: DPM) and Buckeye Partners LP (NYSE: BPL), which both added more than 6%. Multinational oil companies were sinking in the afternoon. Exxon Mobil Corp. (NYSE: XOM) and Chevron Corp. (NYSE: CVX) were both down more than 0.4%. Traders are keeping a keen eye on Hurricane Joaquin as it makes its way up the east coast, strengthens into a Category 4 storm, and threatens energy infrastructure. On Tap Friday: Tomorrow, a busy economic calendar features the September unemployment rate, an update on average weekly earnings, and the August report on new manufacturing orders in the United States. Further strength in the U.S employment sector will be critical when the S. Federal Reserve decides whether or not to raise interest rates this month. On the international front, pay attention to the release of August retail sales in Australia, and the UK Construction PMI report. Stocks to Watch No. 1, FCAU: Shares of Fiat Chrysler Automobiles NV (NYSE: FCAU) gained more than 2% alongside its competitors Ford Motor Co. (NYSE: F) and General Motors Co. (NYSE: GM) on news car and light truck sales in the United States hit a seasonally adjusted annual rate of 18.2 million last month. That represents the highest pace of sales in 10 years. Meanwhile, Fiat remains engaged in a contract battle with the United Auto Workers union, which widely rejected a new employment contract. The threat of a strike looms, although both sides are working quickly on a resolution. Stocks to Watch No. 2, CELG: Shares of Celgene Corp. (Nasdaq: CELG) gained more than 4% after the company received a stock upgrade from JPMorgan Chase & Co. (NYSE: JPM). Biotech stocks were flat today after a volatile week to conclude the third quarter. The iShares NASDAQ Biotechnology Index ETF (Nasdaq: IBB) was flat on the day. Stocks to Watch No. 3, DNKN: Shares of Dunkin Brands Group Inc. (Nasdaq: DNKN) slumped more than 12% after the company slashed its yearly financial outlook and announced plans to shutter more than 100 locations across the country. Today was the worst day for the stock since its IPO four years ago. Stocks to Watch No. 4, SRPT: Shares of Sarepta Therapeutics Inc. (Nasdaq: SRPT) surged more than 22% after the biotech giant reported long-term effectiveness from its drug targeting a progressive muscle disorder. Stocks to Watch No. 5, TWTR: Shares of Twitter Inc. (NYSE: TWTR) cratered more than 8% despite expectations co-founder and interim CEO Jack Dorsey will be named as the firm's permanent CEO.